Are you looking for something to keep your kids busy? Are you looking for something perfect for Christmas parties, or to share with family and friends? Check out Python Printable Christmas Games Pack! 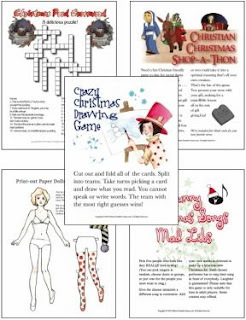 The Christmas Mega Game Pack has over 70 printable games. Styles of games you get: Gift Exchange, Trivia, Ice-breakers, Christian games, Coloring, Scavenger hunts, Office Party, Spot the Difference, Paper dolls, Crosswords, Synonyms, Word searches, Mazes, Letter from Santa, Printable thank-you notes, and more!